Shobha Cameron likes to think of herself as a dancing, singing, free spirit, wannabe angel and mystic in the making. Before the age of nineteen, when she began her studies at the University of Western Australia, Shobha was actively involved in Christianity and sang the protest songs and spirituals of the sixties, in churches and concerts around the city, in her folk duo 'The Greenwoods'. After graduation, she discarded a career as a medical and psychiatric social worker, and returned to her true academic love - anthropology - the appreciation of culture within society in its own context - without reference to the rules, rituals or values of any other tradition i.e. without judgment. 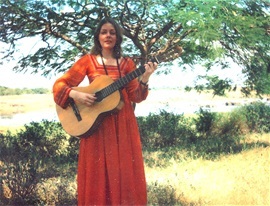 Following a relationship and marriage of six years with a lawyer who was not spiritually-inclined, but seriously involved in politics who enjoyed singing with her in Gilbert and Sullivan operas, Shobha gave up political activism and social concerns for a year of reflection and writing poetry - whereupon she experienced a spiritual 'vision' and left the marriage immediately. This led her to embark upon a journey embracing Theosophy, Hinduism, Buddhism, Sufism, the Christian mystics, paranormal phenomena, spiritualism and various forms of meditation. As part of her doctoral research in anthropology into the influence of eastern mysticism in western countries (especially Zen Buddhism), Shobha participated (in Australia) in the activities of many 'new age' groups with an eastern orientation and discovered Bhagwan Shree Rajneesh (now known as Osho) - a professor of philosophy, mystic and 'enlightened master'. In the seventies, his ashram in Pune, India, was attracting those from western countries and from India, who were engaged in a search for spiritual understanding. In 1976, within a few days of reading Bhagwan's book The Way of the White Clouds, Shobha sold her possessions (including her beloved piano) and left for India. Her psychological travels of the heart and mind are documented in Journey of a Sannyasin. Briefly returning to Australia, she assisted in the founding of a spiritual community (which became known as the 'orange' people, because they wore orange robes) and lived in the 'bush' alone - in the early months of its existence. Shobha returned to India in 1977 and remained for five years in the Rajneesh ashram. It was a home-coming in the spiritual sense, and she was no longer searching for 'answers'. The nature of her evolving relationship between the 'master' and the disciple, is charted in Journey of a Sannyasin. Shobha defines a disciple or sannyasin as 'one who is on the quest for enlightenment and willing to learn'. As her father was dying, Shobha returned to Australia in 1982 to become part of the blossoming sannyasin community in Western Australia - though in a peripheral role. She moved and worked primarily in university circles - at times as the only Rajneesh sannyasin in a population of six thousand staff and students. After performing as a soloist and member of yet another duo 'Heart and Soul' at folk clubs and festivals for twenty years, she returned to her other great love - opera - and recorded a very mediocre CD of arias and joined the on-stage chorus of La Traviata in order to be able to say 'I've done it' (at last). Post-India, it has usually been her lot to operate primarily amongst those who have not yet become interested in spirituality or who adhere loosely to the religion of their birth and are open to new ideas. She often enters people's lives when they are at a 'turning point', and departs when they have found a new direction. This is how she sees heer 'angelic' function. It is not calculated but happens spontaneously. In essence, her role is that of a provocateur: to encourage those with whom she interacts to laugh, sing, question, doubt, discuss and perhaps embrace a path which is founded upon uncertainty, inconsistency, paradox and celebration of the unknown - the path of the mystic. Mystics understand that we operate in parallel universes - the material and the spiritual, and that we are not entirely whole until we embrace the spiritual dimension. For each one of us, this is a journey which can only be undertaken alone - though perhaps now and then in the company of like-minded souls, who are on a similar quest. The conclusion of the mystic is that god or the cosmic energy or whatever you choose to call 'it' - is love. The acceptance of our own divinity or 'remembrance' of our loving nature, is a common theme in Shobha's writings, which emphasise that this understanding can only occur through 'experience' not the acquisition of knowledge. By discarding all that we know (unlearning), we become receptive to the phenomenon of 'love' - which is beyond words or expression. Shobha now sings in yet another duo 'Angelicus' (messengers of god) and their repertoire is punctuated with many spiritual songs, as well as folk, opera, musicals, hymns and popular music. 'Born to sing' is the bumper sticker on Shobha's car (which is also called 'Angelicus') and she often bursts into song at the ocean where she begins each day at 5.30 am - come rain or shine.